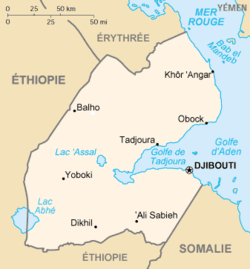 The city of Djibouti is the capital and largest city of the Republic of Djibouti. It lies on a peninsula between the Gulf of Aden and the Gulf of Tadjoura. Djibouti is home to about 400,000 people. Features of Djibouti City include beaches, a large Central Market, the national stadium Stade du Ville, the Presidential Palace and Hamouli Mosque. The Djibouti-Addis Ababa Railway runs from the city to Addis Ababa. Djubouti is also home to the Djibouti-Ambouli International Airport. 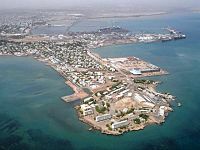 Djibouti was founded as a seaport in 1888. The city became the capital of French Somaliland in 1891. It replaced Tadjourah as the capital. The peninsula was chosen because it is a natural port. It was attacked during WW2 by the Italians and later by the British. 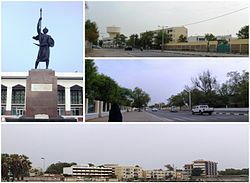 Wikimedia Commons has media related to Djibouti (city). This page was last changed on 26 November 2017, at 03:00.